As soon as I get around to taking and posting pictures of my apartment, you'll see that I have an itsy-bitsy kitchen. Sometimes I just sit and stare at it---brainstorming all the storage solutions I've seen on the internet, pondering how I can unleash my creative genius and create a magical place to cook. I've come to the conclusion that I want some pegboard. 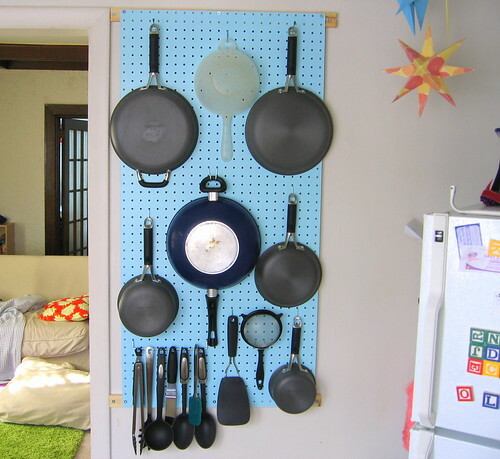 Pegboard just seems ideal. I can paint it a bright, pretty color. I can free up drawer space. I can feel organized. Handy tools will be right within reach. And it will add visual interest. How do you feel about pegboard? 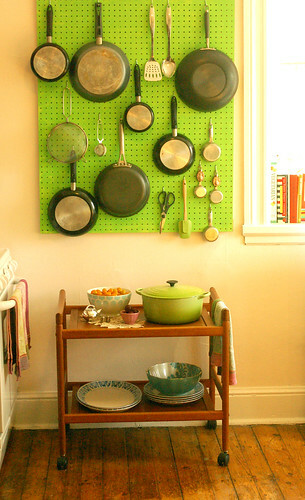 Not only is it cute and functional, if you watch "Julie & Julia"... Julia Child's WHOLE KITCHEN was pegboard walls. It's all in the Smithsonian or something now. 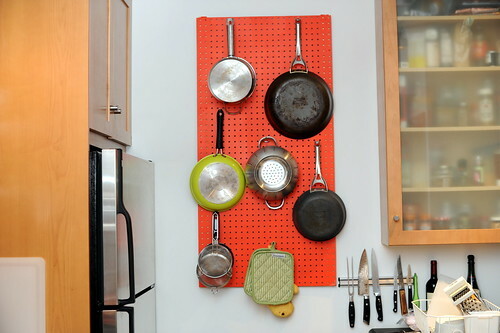 In case you needed yet another reason to go with the pegboard in the kitchen, haha! That looks awesome. I hate having to dig through pots and pans, and this seems like the perfect solution. pegboard worked really well in my closet. we just moved into a 106 year old house and the closets are tiny! mine is only just as deep as a pair of my shoes, so of course the door won't even close if i put a hanger in there. i decided to use pegboard and hang my clothes from the easily movable hooks. its still a little tight but it beats having to fold everything and stash it in trunks, shelves and drawers!